With last weeks London Fashion Week in full force the obvious question on everybodys lips was 'WHO will design Kates Middleton's wedding dress?' Well it looks like Dame Viviene Westwood will NOT. DVW was asked at the Royal Courts of Justice, the show venue, if she will be designing the wedding dress - her reply was hilarious)) "
''I would have loved to have dressed Kate Middleton but I have to wait until she kind of catches up a bit somewhere with style.'' She laughed then added: ''Sorry. I'm not going to say any more, that's it. Check out this article in the Daily Telegraph: Kate Middleton needs to catch up with style. all those above are already established and successful as designers therefore no need for the extra PR. They are themselves high profile celebrities with no need for more profit; where as a new, young designer needs all the help he/she can get. So much creativity lurks around this small island surely shes out to get something unique, romantic and feminine. Or perhaps not?? Anyway, watch this space, as yours truly is working on a design in her head as the perfect remedy to it all ... the 'Alternative Royal Wedding Dress' ... utterly wacky, completely different, and a celebration of style and creativity ... or what is left of it! ... as I said, watch this space! 21 February 2011: "GIGGLE ALLEY"
maybe I should make a collection inspired by forests (ha what a brill idea) . The first one was made few years ago, inspired by another forest - the wooded valley of Tilberthwaite. It was a bridal dress , and because it still fitted me, and seemed so appropriate, I couldn't resist redesigning it to wear for the Grizedale rally a few weeks ago. well white )) So because, it was National Wedding Week and the Whinlatter rally I decided to create something bridal, but not without adding a real splash of colour first!. So here it is ... 'Giggle Alley' ... but don't expect it to stay like this for long, I still have a few ideas for tweaking it a little! Hope you like my sulphur tuft toadstools too ... well, there is more to a forest than trees, even if you can't see the wood for them! its great that people can express their opinion freely without interference. Some out there have no idea how lucky they are to have that right. If anything more people should voice their concerns. Freedom of Speech as it exists here in this country is vey precious, but it is also something that can be lost so easily; democracy is so fragile. So there we were on a very cold white winter day. I couldnt believe it when I looked out of the window in the morning SNOW. Brrr, freezing cold. All I could think of was how I was going to stay warm in the new dress I had created for the demo - 'Giggle Alley' was going to prove an appropriate name in more ways than one! And yes my next question was, will people turn up in this weather? but my worries disappeared, first as the snow cleared as we headed north then as soon as we arrived at the visitors centre and there were already people milling about. 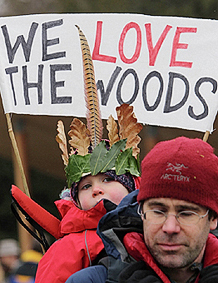 More then 500 people gathered to show a very strong support for our woodlands. Although there was an air of celebration following the Government's U-turn last week, there was a note a of caution in all of the speeches. The proposals to make it possible to sell off all of England's public-owned forests have now been dropped. However, they can still sell off 15% under current legislation a matter that needs urgent clarification. 15% of the the public-owned woodland in England translates to 30-40% of the Forestry Commission woods here in the Lake District National Park. Check out www.lakelandbeyond.com and you will see that there are rather a lot of them and where they all are! Speakers at Whinlatter included climbers Sir Chris Bonington and Leo Houlding, Lord Clark of Windermere, Keith Fitton who is one of the Lake District Osprey Project volunteers. 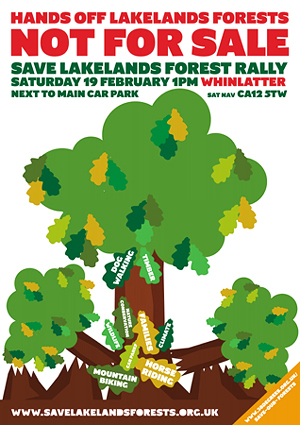 Good work SAVE LAKELANDS FORESTS Team!!! 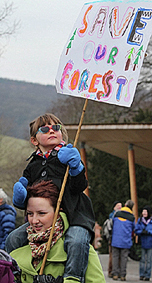 Keep checking www.savelakelandsforests.org.uk for further updates, information and news articles, and also for picture galleries from the Whinlatter event. The rally was over by mid-afternoon so, having already come so far, we couldn't resist making the most of the day and pottering around. The clouds had lifted and as we approached Bassenthwaite they broke to provide these stunning views of Skiddaw - the photos were taken from the lakeshore and also on the hillside near another of those Forestry Commission woods that could be under threat - Setmurthy. Indeed our journey home was rather convoluted to include fish and chips at Crosby's, my favourite fish and chip shop - well, why not? My only pleaure in these days of doom and gloom, and working endlessly to pay bills, is the odd tipple of red wine, and ... when the chance arises, fish and chips ... and I don't get over to Whitehaven often so you can't blame me for taking the chance when it comes! Anyway, what was interesting about the journey home in the dark was just how many of those green Forestry Commission signs we passed. I've never really noticed them before but now they seem to jump out and scream 'protect me' - Blengdale, Irton Pike,Parkgate, Miterdale, Giggle Alley (hehehehe), Hardknott ... and finally Chapel House and home. And when you look at the map we passed with in a whisker of many more of them - Wythop, Cogra Moss, Ennerdale, Dent, Lowther Park ... and so on! As soon as that sun comes back out I think it is time to make the most of them ... while I can! The news that the Government has just made a U-turn and has called off the sale of the Forestry Commssion woodlands is excellent. However, I am only cautiously optimistic - call me a cynic if you like but nothing has changed with regards to the proposed sale of 15% of the woodland that is presumably still scheduled to go ahead over the next four years, Untll this has been clarified I will not be dropping my guard as 15% over England as a whole could actually represent 30-40% within the Lake District National Park So yes, I will be going along to Whinllater on Saturday and expect you all to be there - no excuses accepted!!! I am busy with a new bridal dress inspired by the forests to wear at the rally ... no clues but it will be ... what should say? Different? But then again you wouldn't expect anything else from me. All I need now is a name for it ... has to be dedicated to a Lakeland wood. How about Isel? Or Messengermire? Or perhaps Giggle Alley? Well hello my dear friends and fashionistas. It's only polite to introduce myself, I'm an avant-garde designer working in Cumbria and for the next few seasons I shall be keeping you updated about the best bits of the wonderful and hectic world of fashion. So, for starters a brief on 'what we are wearing next season', what's changed and who's new.
. those bits that however much I try to control them, they never seem to go away. And, who's new? Sarah Burton., the new creative director for Alex McQueen. I mean not everybody can get away with a green jacket, pink shirt, red trousers and purple shoes, can they? A second part of this season is small flower prints. Laura Ashley here it comes!! If you're old enough you will remember the long floaty dresses with flower prints during the 70s. They are back, together with pleats, chiffon and fluid fabrics. Cotton is best for these prints, wonderful to work with and soft to wear. Very girly. And this is the look - a pretty dress with a sleek haircut, and clean, fresh make-up. Sounds very 60s doesn't? But it's actually a bit of 60s and a bit of 80s. It is really up to you, you either go for a pretty dress with bright red lipstick and clean free make-up and voila the 60s look alternatively go for the vamp eyes with no lipstick and a bit of the 80s it is. Oh, and don't forget the pumps. A must. However, if you are used to high heels - not a problem - make the most of it, they make the pins look longer Mind you that much maligned 70s footwear is creeping back up, slowly but surely! Out of all this you have to remember, wear what you like and how you like it with or without the fashion trends. Personally, I'm always for be yourself and wear whatever suits your personality. Unfortunately 'personalities' are making a disappearing act. I see far too many people out there wearing whatever a celebrity wears or what the supermarkets and High Streets sell. Why oh why? What has happened to creativity and individuality? I mean doesn't it tell you something when somebody like Kate Moss is shopping in second hand shops? Or 'Retro' shops as they are sometimes called nowadays! And isn't she supposed to design for Top Shop? Is she in there for ideas? Hmmm! 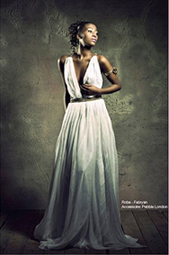 Fashion is there to show us that there are plenty of alternatives, and not to impose on you what you must wear. You don't always have to blindly follow fashion, well you can if you like but try to be unique. Fashion is there to help and guide you if you get stuck at a crucial moment (a date, a wedding or a party) and to awaken our creative minds. And, because we are now at the subject of fashion shows I cannot help thinking about one of the most influential fashion designers. The sadly departed Alexander Lee McQueen. Yes my fav together with Jean Paul Gaultier, John Galliano and Dame Vivien Westwood. How would the world look if these four had come together to design everything around us from cutlery to door bells? This will be the first year without his raw creations and yes, I know Sarah Burton, the new creative director at Alex McQueen will do all she can to keep the creativity at the same level, but as we all know, it can never be quite the same. He was the mind and soul of his empire and he cannot be replaced. and she looked stunning. Yes she arrived at the church sitting side saddle on her horse, just as Victorian ladies used to. but the church panel had a different idea unfortunately it was standing out too much and the vicars wife didnt like it so I had to call hubby to bring a boring tailor dummy. What can you do? By the end of the day it wasnt my show I was only there to help Charlotte to exhibit her wedding dress as best as possible. and how wonderful that these dresses from as far back as 1905 and 1948 are brought out in the daylight out of cupboards and boxes to be appreciated and admired by me) and the younger generation. My grandmother was responsible for my dressmaking bug - she used to make things out of nothing. Some of her customers were in difficult financial circumstances and could never buy new fabric but needed a new dress for a job interview. She never ever turned them down. It was a challenge she used to say. 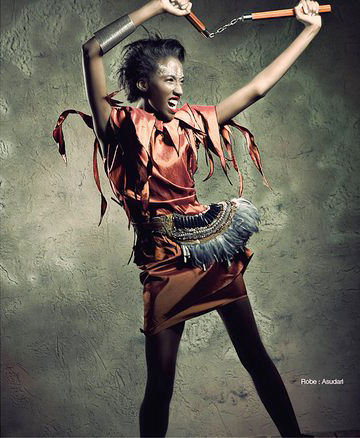 If you can create a dress out of scraps, it will be easy peasy to work with brand new cloth ... and she was right. I never actually believed that my dress can look quite like that when I designed it! 2 February 2011: IF IT AIN'T BROKE - DON'T FIX IT! 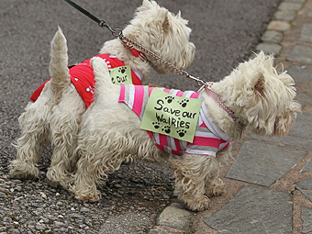 almost half a million people have now signed in support of the campaign. but they never let us down as you can see from the pictiures. Over 1500 people were there voicing their concerns regarding our forests!! HANDS OFF!! And there were passionate speeches by Lord Clark, Eric Robson and Jack Ellerby, not to mention local MPs Tim Farron and John Woodcock who ripped up the proposed bill for the cameras. 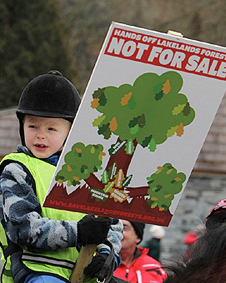 Please refer to the Save lakeland's Forests website for a full report and all the latest comments ad press releases. a dress inspired by forests. 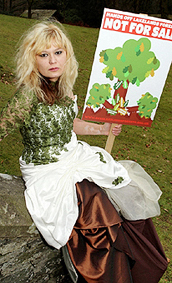 A dress called Chapel House after the Forestry Commission forest behind my house. Well, what else can I do to show my support? The dress is rather bridal, an earlier dress redesigned so that I could wear walking boots and it wouldn't matter if the train got mucky - which it did. The mud and leaves just enhance the design. 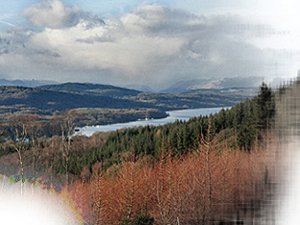 I'm now working on a completely new dress for the Whinlatter event in two weeks time - and its going to be fab! So what next? 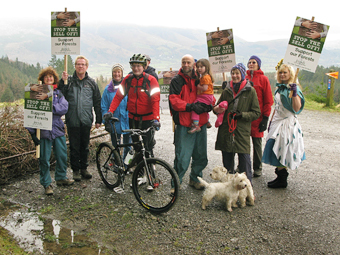 Sign the 38degrees Petition, write to your MP, and come along to WHINLATTER FOREST near Keswick at 1pm on Saturday, 19 February, No excuses - just 30 minutes or so from West Cumbria, Carlisle and Penrith and the M6, and a bit further from the south. Make the most of it and spend the weekend in Keswick if you are coming from further afield. We have nearly 40 forests in Cumbria and if we don't shout about them now we might lose them altogether, or at the very least access to them, forever! So come and add your voice before it is too late. YOUR FOREST NEEDS YOU! Chapel House is my forest. Well, actually it is your forest too, It is managed by the Forestry Commission so it belongs to all of us. It is a wonderful forest, stretching from the shores of Windermere above the village of Staveley-in-Cartmel, to the slopes of Gummers How, and over Cartmel Fell to embrace Simpson's Ground reservoir. It is on my doorstep so I rely on it for inspiration - the colours in autumn, the frozen trees in winter, the birdsong in summer or the bluebells in spring. The shade and light, the vivid colours of the mosses that hang from the trees and the old dry-stone walls, the animals I see all the time - red and roe deer, squirrels, foxes, badgers, voles, the buzzards that soar overhead and the woodpeckers and owls that interrupt the silence, day and night. Even the sound of the chainsaw, and the smel of woodsmoke and resin. It is all part of the forest. I can escape and lose myself there for a few minutes or for a few hours. It is a paradise that anyone can share. It makes you glad to be alive. It is something to feel passionate about. Chapel House is predominantly used for commercial timber production with extensive stands of spruce, fir and larch, but it also comprises some beautiful mixed and deciduous woodland, carpeted with bluebells in the springtime. There are also some rather spooky, ancient oak trees near the summit - I always call that part 'Sleepy Hollow'. Some of this has been felled with the intention of allowing natural regeneration and the development of a wilderness and wildlife haven along the lines of Ennerdale. It is what the Forestry Commission call Multi-purpose Forest. 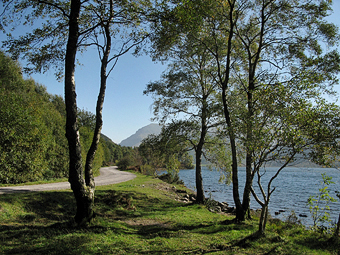 The commercial extraction helps to fund the management of natural wilderness, while the well maintained trails are a magnet for walkers, mountain bilkers and horse riders. All of this could be lost if the forest is sold. There would be no guaranteed access for mountain bilers or riders. Tracks will become off bounds and what about the car parks? Nearby Canny Hill was recently sold and access has already been cut off, or made difficult. And, despite assurances that access for walkers will be maintained for future sell-offs, who is to say a commercial operator will really invest in repairing footpaths? The lower paths in Chapel House soon become entangled in brambles and bracken if not cleared, while some of the higher paths cross bogs where the Forestry Commission have kindly provided duckboards and bridges. Who will pay for these in the future, and who will maintain and protect the natural woodland areas? Do you really think a profit-driven private venture will invest in wilderness when they can boost profits by returning to the days of endless conifers? Of course not? Where would the money come from? This whole plan is absolute madness ... if it ain't broke, they say, don't fix it? So why meddle with something that not only works well, it actually provides a benefit for all of us? They complain about kids spending more and more time in front of the TV or a computer so what do they do? They sit in Westminster formulating hair-brained schemes that will restrict access to wonderful green spaces such as Chapel House? Last week we spoke to a journalist in London who never ventured out of the noose of the M25 ... he claimed forests would give him a 'lurgy' - he couldn't relate to them ... no wonder! These people really need to get a life before its too late.